How awesome to see the first Hawaii-born US President being sworn in on Jan. 20, 2009. I couldn’t be in Washington, DC for the occasion, so I did the next best thing. To visit Obama in Japan. The city of Obama in Fukui Prefecture facing the Sea of Japan has an Obama booster club called called “Obama wo Katte ni Oen Suru Kai” (Obama Informal Booster Association). It has been active in promoting the city just because it has the same phonetic name as the US President. They even formed the Obama Girls and Obama Boys hula troupes since Barack was born and raised in Hawaii (not far from my own high school which Barack would have attended if he didn’t attend the private school of Punahou). The city of Obama is decorated with banners and signs showing its support for Barack. In Feb. 2008, Barack even sent a thank you letter to the city for its support. 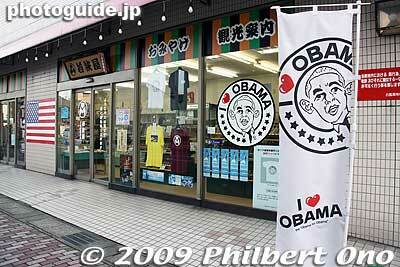 There is one shop which sell various Barack Obama goods, even manju (bean-paste cakes). In the evening of Jan. 20, 2009, it held an event at Hagaji temple. 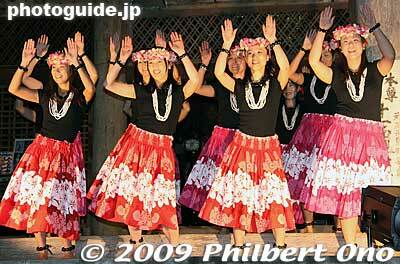 The highlight was the ringing of the temple bell at 7 pm to pray for world peace, and the Obama Girls dancing the hula.